The solution here is to use Network Time Protocol (NTP). 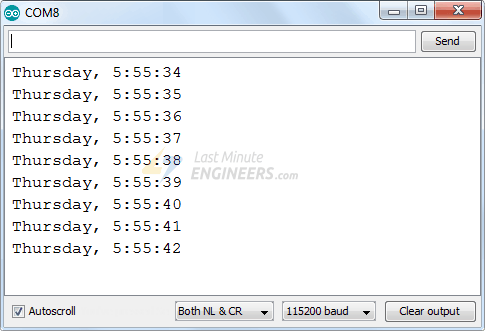 If your ESP8266 project has access to the Internet, you can get date and time (with a precision within a few milliseconds of UTC) for FREE. You don’t need any additional hardware. The client device such as ESP8266 connects to the server using the User Datagram Protocol (UDP) on port 123. 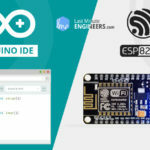 But before venturing further into this tutorial, you should have the ESP8266 add-on installed in your Arduino IDE. Follow below tutorial to prepare your Arduino IDE to work with the ESP8266, if you haven’t already. 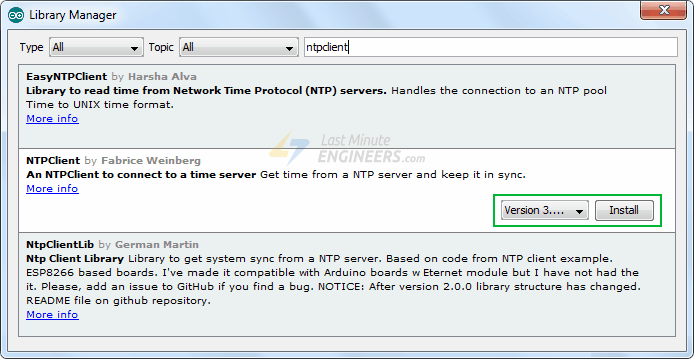 The easiest way to get date and time from an NTP server is using an NTP Client from arduino libraries. Follow the next steps to install this library in your Arduino IDE. Navigate to the Sketch > Include Library > Manage Libraries…Wait for Library Manager to download libraries index and update list of installed libraries. Filter your search by typing ‘ntpclient’. There should be a couple entries. Look for NTPClient by Fabrice Weinberg. Click on that entry, and then select Install. 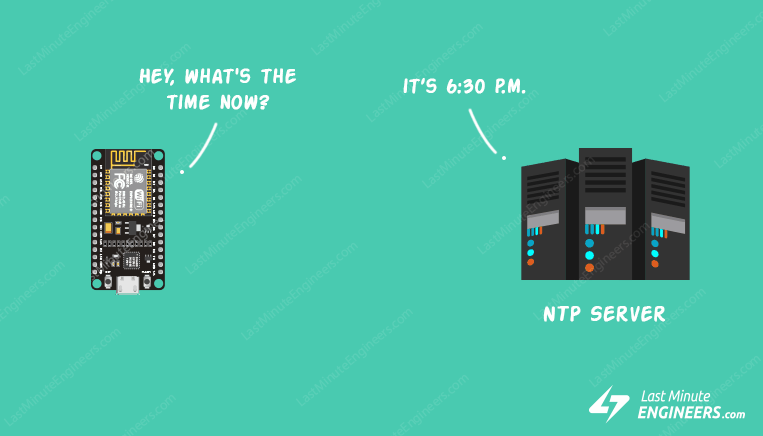 The following sketch will give you complete understanding on how to get current day and time from the NTP Server. After uploading the sketch, press the RST button on your NodeMCU, and you should get the current day and time every second as shown below. 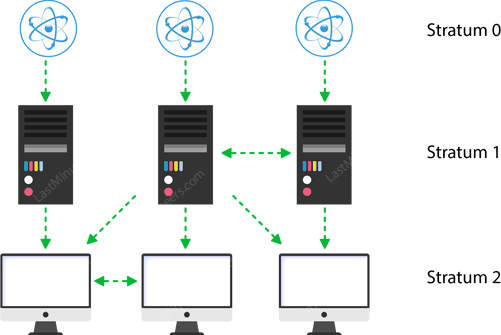 NTPClient.h is time library which does graceful NTP server synchronization. ESP8266WiFi.h library provides ESP8266 specific WiFi methods we are calling to connect to network. WiFiUdp.h library handles UDP protocol like opening a UDP port, sending and receiving UDP packets etc. Next, we set up a few constants like SSID, WiFi password & UTC Offset that you are already aware of. We also define daysOfTheWeek 2D array. Now, before initializing NTP Client object, we need to specify the address of the NTP Server we wish to use. pool.ntp.org is an open NTP project great for things like this. Once ESP8266 is connected to the network, we initialize the NTP client using begin() function. Now we can simply call the update() function whenever we want current day & time. 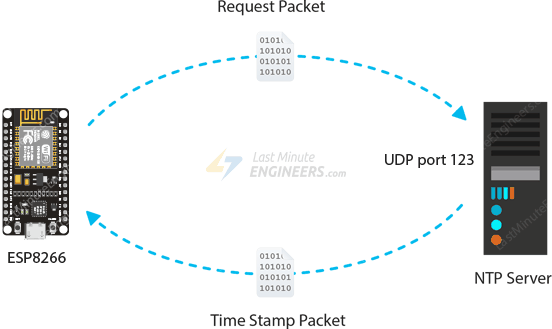 This function transmits a request packet to a NTP server using UDP protocol and parse the received time stamp packet into to a readable format. You can access the day & time information by accessing the NTP Client library functions.